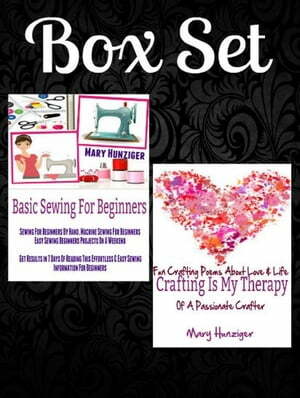 Collins Booksellers - Box Set: Basic Sewing For Beginners: Sewing For Beginners By Hand, Machine Sewing For Beginners + Crafting Is My Therapy: Fun Crafting Poems About Love & Life Of A Passionate Crafter by Mary Hunziger, 9781513075167. Buy this book online. Everything has been packaged into one easy to consume sewing book with 400+ sewing ideas & resources. Did you know this: according to an April 2011 article in Inc. magazine, the average Etsy seller makes just $785 a year. I am Mary Hunziger, and I am a very passionate crafter and Etsy seller myself. In this sewing book fro beginners, I am going to show you how to get started and go beyoind Etsy sooner than you might think! Other crafting friends of mine have been able to turn their passion into profit and today run six figure craft businesses and authors like Jim Cockrum, Seth Godin, and Tim Ferriss are typically calling these passionate businesses the true "virtual empire". This book is going to guide you through the 9 best ways to get started with your first sewing project. This sewing system is going to help achieve this goal. Once you have been able to apply this system, you are going to feel inspired, encouraged & motivated about your first creative sewing experience. You will be able to identify all the possibilities and creative ways that you can apply as a sewing crafter & this guide will act like a starting point from where you can explore your exciting sewing path. Maybe you just like to learn some sewing techniques to save some money & as a homemake. There are other individuals who have developed a whole career & passion out of their sewing skills. In my book series called From Passion To Profit, I have talked to countless crafters who have developed their business around sewing. You can use this guide as a starting point from where you have all the options to develop your passion for sewing into a sustainable business or a hobby that you like to do on a weekend.